Extra reach for big game, varmints and predators. 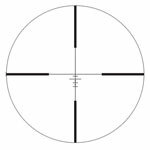 A high-performance riflescope designed to deliver the extra reach and resolution required for hunting western big game or shooting distant varmints / predators. MeoTrak RZ hunting turrets are finger adjustable and easily and quickly resettable to zero. A convenient side parallax adjustment guarantees accuracy from 30 yards to infinity. Field of View: 24.8' - 8.4' @ 100 yds.